It had been a long season…one of more “downs” than “ups.” Sometimes life is like that. They say that a mother is only as happy as her unhappiest child…and, wow, do I get that now. Still, I held out hope (even if it was just the tiniest glimmer.) I had been looking forward to this day, a day where we could all unceremoniously start a new chapter. It had arrived…without fanfare and without jubilation. Only numbness and fatigue. I had gotten so used to the old pattern, the barely breathing pattern where the emotions were so close to the surface that it was practically a miracle if no one noticed. The questions still resounded in my head, “if only…could I have…and what if?” Pointless questions really. I had gone over them a thousand times in my mind. Day after day. I prayed. And I kept praying. I trusted that the lesson would reveal itself. Maybe. Someday. In the quietness of that afternoon I found myself searching out a needle and thread. Crossing a “finish line” meant that I could now tend to things that I had put off. The scattered stuffing of the basement tiger could no longer be set aside. I asked, “Don’t you think it’s time we got rid of this? Maybe it’s time to throw the tiger away….” No. It was a gift. It was still useful. It was a part of the family. In reality, it was huge, it had a hole, it was getting stuffing EVERYWHERE. 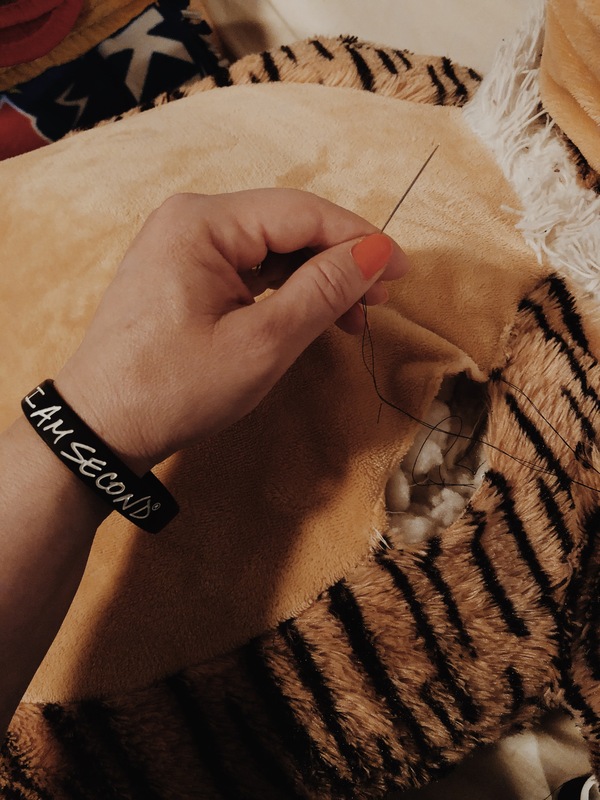 I stitched up the stuffed tiger and ran my fingers over its new battle scar. Not bad. For the most part, the new stitches were practically undetectable…that is until the last few. Probably where the hole started, I thought. Damaged faux fur, but totally fixable. With the right perspective…totally fixable.